MORGAN PARK — Isaac Nevitt said he knew something was wrong when city workers outside his Morgan Park home began to scream Wednesday morning. 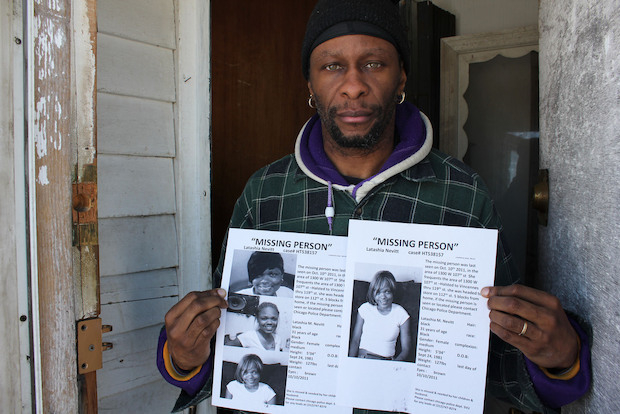 The father of three — whose wife, Latasha Nevitt, has been missing since 2011 — went outside to see what happened. A crew working around the corner in the 10700 block of South Loomis Street had found a body wrapped in plastic inside a drainpipe, the workers told Nevitt. Police confirmed that a body, believed to be a woman, was uncovered about 10:47 a.m. Wednesday. The Cook County Medical Examiner's Office pronounced the woman dead on the scene at 12:45 p.m., and an autopsy was scheduled for Thursday. Over the next 24 hours, speculation swirled that the body belonged to Latasha Nevitt, a 31-year-old mom and Everest University student who went missing more than two years ago. She left her home in the 1300 block of West 107th Street on Oct. 10, 2011, to run to a corner store, her family said. She never came back. The body uncovered Wednesday was found about 160 feet from Latasha Nevitt's house, where her husband and three children still live. "I hope it's not her," Isaac Nevitt said as he stood on his front porch Thursday morning. "I hope she's still out there somewhere." Isaac Nevitt, 41, said he's been in touch with police since the body was found. Detectives told him they couldn't provide any information until autopsy results came in. While the autopsy was slated for Thursday, conclusive results can sometimes take weeks if dental records or toxicological reports are needed. "I'm just sitting here looking at the wall waiting," Isaac Nevitt said. "That's the hardest part — the waiting. I've been waiting for 2½ years. I would wait another 2½ years, as long as it's not her." Isaac Nevitt said he's never understood what could've happened on that October night. The couple had just gotten married in July 2009 — on his birthday — and had been together 15 years. They have three children: a daughter who's 13, and twin sons, now 4. Latasha Nevitt was studying to become a dental hygienist. "She wouldn't have just left and walked away," he said. A black-and-white photocopied missing poster is taped to Isaac Nevitt's front door. He said he's made multiple posters over the years, featuring different hairstyles in case his wife has changed her look. Isaac Nevitt said "90 percent of the people out there" think he's guilty of killing his wife, but he insisted he's "not the person everybody claims I am." He said: "Anytime something like this happens, the No. 1 suspect is the person that they're with. Nobody's ever cleared until the person is found. ... I was expecting it, but I don't want my kids to get used to it." If Latasha Nevitt is still alive, her husband said, he wants her to know she can always come home, no matter what happened. "We don’t have to talk about it as soon as you get here," he said. "We can talk about it when you’re ready to talk about it. I didn’t change the locks. I didn’t change anything. All her stuff is still where she left it. It’s her house."